Select Shirts at a Great Price! Pi shirt not nerdy enough for you? Count on us for some fresh, genuinely nerdy shirts to show off your love for science, math and technology. We feature only the nerdiest shirts - designed by nerds, for nerds! Not sure which shirt to give your favorite nerd? We offer gift certificates - give the gift of nerdy shirts! 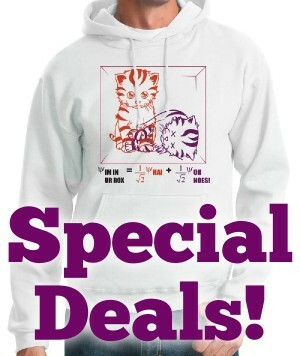 This physics nerd shirt shows Schrodinger's LOLcat in a superposition of the "HAI" and "OH NOES!" states. Doublesided! This math shirt features Oscilloscope Prime of the Autocorrelationbots. A physics t-shirt featuring the Meissner effect. Planking on Planck's constant physics t-shirt. This math nerd shirt features Sinewave of the Decepticonvolutions. A math joke t-shirt featuring the Banach-Tarski Theorem. This math nerd shirt illustrates connections between Number Theory, Combinatorics and Set Theory. From afar, it looks like a soccer jock shirt - but it's actually a very nerdy math shirt. This graffiti-inspired physics nerd shirt celebrates the reduced Planck's constant. 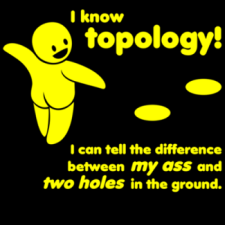 This math nerd shirt demonstrates a topological proof of the Fundamental Theorem of Algebra. The back of these nerd shirts feature complete working LOLcode for an N choose K function. The back of this doublesided chemistry shirt says "CARBON 60," in homage to the buckminsterfullerene's chemical formula. This nerdy physics shirt shows Schrodinger's Cat in a morbid superposition of states. This pro-evolution shirt features Homo erectus and a question of paternity. This evolution shirt shows the rear view of the human pelvis, highlighting the coccyx - a vestigial tail. 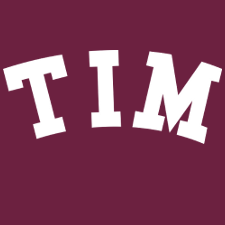 The TIM shirt will make MIT nerds look great in front of the mirror. A nerdy Caltech spoof shirt. Matching programming nerd shirts for babies and parents. These are designs from our sister store, Kawaii Shirt Shop. Kawaii Shirt Shop specializes in cute and quirky shirts, some of which are nerdy. A physics / electrical engineering shirt with cute and happy resistors.